The talk was erudite, sometimes tentative and free flowing; conversation between experts, without the stilted formal interviewing now so common on the media and in pre-concert talks. Clementi certainly came off with respect enhanced, both by our being reminded how Beethoven admired Clementi and, by illustrations from the Sonata 3 Dido abbandonata, redressing the common assumption that his music was more about brilliance and virtuosity than affective expression; less complicated than Beethoven's layering of allusions, but undeserving of relegation to 'interesting historical figures' who are almost never heard in concert. A huge privilege that these research events are "Admission free -all welcome". Is this stimulating opportunity available in other UK academies? It should be, to help educate the listening public alongside music students in a way that augments (and sometimes corrects) received opinion from reading. 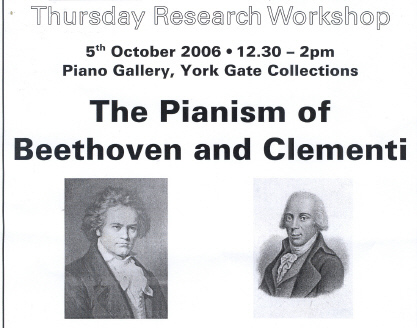 There is to be a Clementi series at RAM next year. with its encouraging heading "Just turn up!"